After reading this article you will have your eyes opened! I wanted to gather the most common myths together and reveal the truth behind them. Sit back and enjoy reading! Prepare to hear the harsh truth. The airline tickets won’t get cheaper the closer it gets to the departure date. Airlines price their tickets according to booking classes and fare basis. When the cheapest booking classes get full only more expensive ones are left. Usually near the departure date there aren’t any cheap seats available and at best only a few seats left in the more expensive booking classes. In some very rare cases if a group reservation has been cancelled there might be some cheap seats left right before the departure. NOTE: This is really rare! So to get cheap airline tickets buy them well in advance! Myth 2. Overbooking – I will get in to my flight since I have paid for my ticket! All airlines overbook their flights. In most flights there is at least one passenger who is a “NOSHOW”. The airlines count that some of the passengers will cancel their trip before the flight and that there will be some noshows in every flight. Tip for traveling: If in your ticket you find an indicator “standby” replacing your seat number contact the check-in counter. It means that you don’t have a seat yet and you might not get in to the flight if all the other passengers shows up. If the check-in agent can’t help you, contact your gate agent and see if they can give you a seat. Remember to be nice – that can make the difference when they are deciding who gets the seat! Keep on track with your flight and gate changes with these boards. 😉 You can also see the codeshare numbers for the flights! Myth 3. The plane will wait for me – I have my ticket! Even though you have a paid airline ticket it doesn’t mean that the plane would wait for you. If you are late or your connecting flight is late you might actually miss the flight. I have seen too many transfer passengers who have claimed that the plane will wait for them since they have paid the ticket. Even though I have tried to politely say that instead of smoking a cigarette or casually eating snacks they should HURRY THE HELL UP. So don’t do the same mistake! Did you know that airlines make the most money by carrying cargo? That’s why the planes won’t stay waiting for passengers. Sometimes if it’s hard to reroute passengers and there is a huge group of them missing due to a connecting flight delay, the aircraft might actually wait for the passengers. Myth 4. Swipe test at the security control – drug test?! It’s funny how people are panicking with the swipe test. It’s okay guys, relax. It’s just a regular procedure if the metal detector peeps. In the security control when the gates react the officers might take a swipe test from your hands and from your waist. The swipe test at security control is NOT a drug test. It’s a test for explosive remains. Drugs are the interest of customs. Cool indicators at HEL (Helsinki) Airport! Myth 5. Security control and customs are the same thing? The main difference between the security control and customs is that security control concentrates on humans and customs on products and items. Customs is interested in what you bring into the country and security control what you have with you in the plane. That is why security control looks for explosives and customs drugs. Myth 6. Oh, it’s so windy that I wonder if the planes can fly? I have heard so many people wondering at airports about the windy weather that I really have an urge to clarify this, haha. As long as it’s not a storm the more wind the better for the planes. Wind gives lift to the aircraft on take-off and the more wind there is, the easier it is to get in to the air. I admit that airports with only one runway can be hit by cross-wind and that is not so helpful during take-off. Otherwise the windier it is the safer it is to fly. Keep in mind: no wind – no lift. Myth 7. But surely ice and snow will stop the planes from flying? Snow is just a matter of clearing out runways and taxiways. Snow knowhow is very high quality in Finland and there has only been one day in the history of Helsinki Airport when the planes couldn’t fly due to snow. 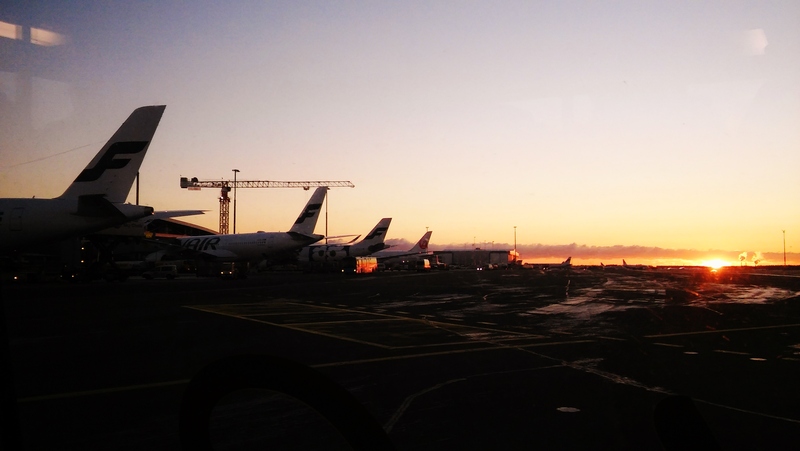 Helsinki Airport was opened in year 1952. Minus degrees means a proper de-icing is needed right before the plane leaves. The plane will face freezing temperatures also during the flight but de-icing is crucial when the plane doesn’t have the possibility to melt on ground. Remember to hurry if you see “BOARDING” next to your flight! Myth 8. Food is not allowed on the plane or is it? For this one I have to say it depends. In the European Union you are allowed to carry food items in your hand luggage. If you have any onward flights be careful with the customs restrictions. Australia is very famous of being very strict with food items. There are also some special cases like Singapore where you cannot bring chewing gum. So just check out the customs regulations before you travel! Myth 9. Problems with my flight and airline tickets – contact airport information! No, no and no. Airlines deal with their own stuff. You can go to the airport information to ask where to find the ticketing office or check-in for a specific airline but they cannot do anything for your problem. You’d be surprised how often customers come to the the airport information desk looking to solve their ticket problems. If your flight is delayed or cancelled or you have some problems with your ticket, contact the airline. If you are otherwise lost at the airport then go and ask help from the airport information desk. This applies to all the full-size airports. Read also how to ease your travels at the airport! Nice post! “I will get into my flight since I have paid for my ticket” … “or not” … I died! Haha. In most cases, there’s always an empty seat somewhere but I wouldn’t want to be that person when the flight is overbooked! I totally agree regarding last minute fares, they just don’t exsist anymore!! Thank you so much! 🙂 I’m glad you like! I haven’t had this kind of surprise yet, to find overbooked flights, in European countries, but I think in the USA is most probably to happen…or so I heard something similar. Valid points.. Thanks for this insightful post..